So you find yourself cruising around the grocery store when out of nowhere your sweet tooth kicks in. You've been doing pretty well laying off the junk food but now the sugar monkey is on your back and he's not letting up. Just as your tempted to B line for the ice cream freezer you have an idea. How about a fruit salad? Yeah, this way you'll satisfy that sugar fix and not feel guilty for cheating on that elusive healthy lifestyle that your determined to stick to this time around. You make your way to the produce section and begin loading up. You grab a pint of strawberries, followed by grapes and Fuji apples. Next you swing by the bananas and find a precut melon combo. Oh yea! This salad is shaping up to be amazing but you can't help but feel that you may have forgotten something. Just then you spot them on the end cap. Of course, pineapples! What fruit salad would be complete without those sweet chunks of golden goodness? As you stand there looking over the selection you realize you have no idea on how determine if the pineapple is ripe or not. You consider just buying the pre cored rings but realize that you could buy 2 whole pineapples for that price. Thats definitely out. Canned fruit isn't really your thing either. So now what? Well if you have ever found yourself in a similar scenario when trying to choose the right pineapple then this blog is for you. Choosing a ripe pineapple isn't always as straight forward as gaging it's color. The good news is that in this blog we will cover 2 additional ways to help you identify which ones to put in your basket and which to leave on the shelf. Assessing the color is the most popular way to identify how ripe a pineapple is . As a pineapple ripens it will begin to change from dark green to yellow, or in some cases an orange color. Once the pineapple has changed into the golden yellow color it has reached its peak ripeness. These pineapples are very sweet. Generally, pineapples with greener shells tend to be bitter and unripe. When cut they typically have pale yellow to whiteish yellow flesh. People who are looking for pineapples that aren’t as sweet tend to choose these pineapples. The flesh tends to be very firm which can be useful when baking. As a word of caution eating unripe pineapple is dangerous and toxic to humans. (For more information visit https://www.livescience.com/45487-pineapple-nutrition.html). Pineapples that have yellow / orange shells are very sweet. These pineapples will have darker yellow/ golden flesh and are soft. If you notice that a pineapple has any brown patches or the entire pineapple is brown, steer clear. This pineapple has already begun to spoil. The color method can be useful but it’s not always accurate. Especially when it comes to pineapples that are transitioning between colors. 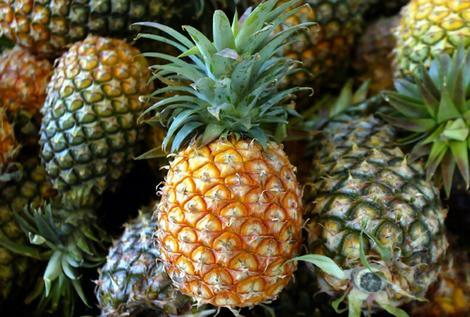 In many cases a pineapple may be ripe enough to eat before it turns completely yellow. It’s very common to find pineapples with a greenish yellow tint in the supermarket. If all the pineapples are this color it can be very difficult to determine which one is ripe. In these situations, its best to use the leaf test. The leaf test is not as widely known as the color test but can be extremely effective when trying to choose a ripe pineapple in situations like the previous scenario. The first thing you need to do is find the leaves in the middle of the crown on top of the pineapple, preferably the one closest to the center. In many cases it may be the longest leaf but please note that may not always be true. Once you find a leaf that is in the middle of the crown give it a tug. If the leaf comes out very easily without requiring much effort the pineapple is ripe. A great way to test this is to attempt to pick the pineapple up by that leaf. If you can lift the entire pineapple by the middle leaf, meaning the pineapple doesn’t detach from the leaf leaving only the leaf in your fingers, the pineapple is not ripe enough. This probably sounds way more complicated than it is but once attempted, most people find that this technique is quite simple. If you find yourself having trouble with the leaf method, the sniff and squeeze test is always worth considering. You’ll want to start out by sniffing the bottom of the pineapple. The more fragrant it is the riper the pineapple will be. If there is little to no scent you can assume that the pineapple is not ripe enough. The next step is to squeeze the pineapple to determine how firm it is. Like most fruits, a pineapple will begin to get softer as it ripens. If you squeeze the pineapple and find that it is very stiff and firm the pineapple isn’t quite ready yet. Now that you know what to look for, go out there and pick that perfect pineapple with confidence. Leave your comments and feedback below and be sure to check back soon for our next blog where we will we cover the best tools for cutting and coring pineapples along with where you may purchase them.